The OBD 1810 modules are supplied in pairs, one Type A and one Type B which work together in a WDM closed loop application. Each module has an electrical SDI in and SDI out connection and uses a single fiber link between the two. Each channel is fully independent and can have different standards and formats of SDI video. The modules auto-detect and re-clock any 270Mbit, 1.5Gbit and 3Gbit SDI source prior to conversion. 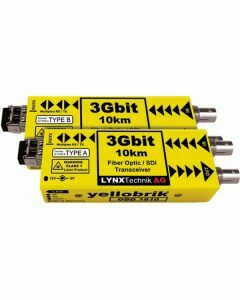 The modules are fully compatible with 3Gbit Level A and Level B formats.